I loved this festival. Very well run and organized. Great people. Good trips and variety of habitats. Thanks for all your hard work. As a novice, I was so very pleased with the staff overall. It was obvious that a loving spirit was injected into the festival from the beginning. I really enjoyed attending the festival, met a lot of great people, saw great birds and learned a lot. An awesome 5th year of MBWBF for me! Thanks for your hard work! A very smooth and well-run, fun event. Thank you--this festival just gets better. It is my main bird event each year! See you [next time]..
Keep it up...solid volunteers and experts. Thanks for a great confab. All of the presentations were superb! The entire festival was well organized. I was delighted with the variety of topics and different events to choose from! The price was extremely reasonable. Dear MBWBF people, the Festival was great! Thank you all. A truly excellent festival this year -- thanks! Wonderful festival. Great job everyone! It was a great bird festival--kudos to all who worked so hard to make it a smooth running success! This was the perfect day--beautiful weather and birds on demand. The Morro Bay Winter Bird Festival is a yearly eco-tourism event promoting an understanding and appreciation of birds and other wildlife and an awareness of environmental and conservation issues of the Central Coast, while contributing to the well-being of the Morro Bay community. The event is sponsored by the Morro Coast Audubon Society in collaboration with California State Parks, the Central Coast State Parks Association, and the City of Morro Bay. Each year the Festival has grown to include more events and to attract more participants ... once again, almost 600 people attended the 22nd annual event in 2018. Morro Bay and the surrounding area is an idea spot for avid birders. Located on the Pacific Flyway, Morro Bay is a Globally Important Bird Area and a designated State and National Estuary. Morro Coast Audubon Society always ranks in the top five for the Audubon Christmas Bird Count. In most years, over 200 different bird species are spotted during the Festival. Check out the drop down menu below to view previous festivals bird sightings. The 2019 Festival will have over 130 events including Nature Track events-- events include field trips, workshops, presentations and Special Events. 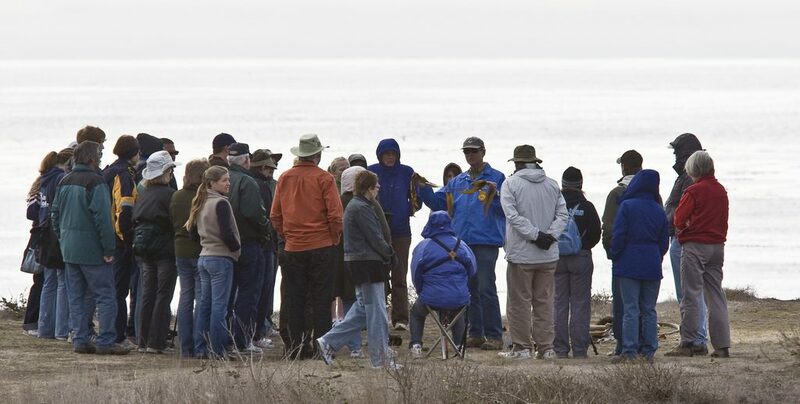 All-day and half-day tours take participants to a wide variety of habitats, including deep water pelagic, oak woodland and riparian, wetland and estuary, and the unique grassland habitat of the Carrizo Plain. Workshops cover a vast array of topics ranging from beginner birding classes to gull identification and a new workshop on bats. Volunteers have organized a packed Saturday "Family Day", which is open to the public and does not require pre-registration. A variety of vendors will be present with nature-related artwork, books, field equipment and attire, and local merchant wares. A number of the events are geared toward birders who are also photographers. Birders of all levels are welcome, and the schedule identifies programs especially appropriate for beginners or children, as well as programs that are wheelchair accessible. The Winter Bird Festival headquarters are at the Morro Bay Community Center at 1001 Kennedy Way. All field trips originate from this location unless otherwise noted in the brochure. You will be provided a map showing all venues when you pick up your registration packet.